Subscribe your users to an AWeber mailing list when they submit your forms. Please note, you must have an AWeber account in order to use the AWeber add-on. In your WordPress admin, go to 'Formidable' → 'Add-Ons' and click the 'Install' button for the AWeber WordPress plugin. Now that the plugin is activated, go to 'Formidable' → 'Global Settings' and click the 'AWeber' tab. Insert your Authorization ID. 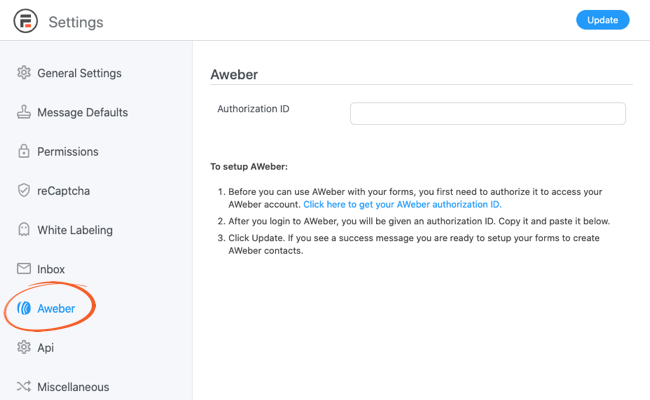 You can create an Authorization ID by clicking the link on the AWeber settings page or click here to type in your AWeber login information and get an Authorization ID. Now you can copy and paste the authorization code from AWeber's site into the Authorization ID field. To get started, go into edit the form which you will be using to subscribe users to a mailing list. Click 'Settings' → 'Form Actions'. Click the AWeber logo in the 'Add New Action' row. 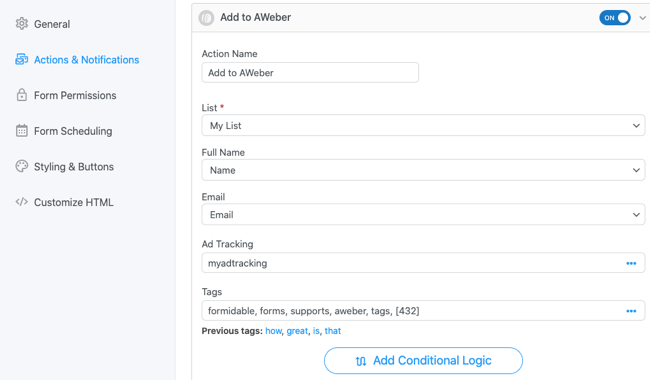 Select the AWeber mailing list that you would like to add subscribers to, then select the name and email fields from your form. If you have a first and last name field in your form instead of a full name field, you can use text calculations to combine the first and last name into a hidden field. Then you can map this hidden field to the AWeber Full Name field. If you have an 'Opt in' question in your form, you can use conditional logic to only add users who intentionally opt in. Please note that Conditional Logic is only available in the Pro version of Formidable Forms. You can use multiple rows of conditional logic for one list. You can also choose that all, or any conditions must be met in order to add the user to the mailing list. Don’t forget to hit 'Update' so these settings will be saved. If you wish to have multiple lists for one form, simply repeat steps 1-5 as needed. If your account info is incorrect, you may receive this error message. This may occur if your AWeber authorization ID was not set up correctly. Please make sure you have downloaded and installed the AWeber add-on properly. If you have any questions or issues, please feel free to open a ticket.